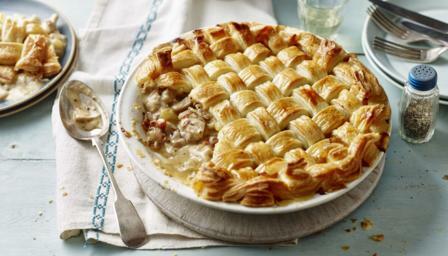 This pie would make a wonderful centrepiece for a family meal. My granddaughters Abby and Grace helped me to make it for the TV programme. For this recipe you will need a 1.75 litre/3 pint shallow, wide-based ovenproof dish, about 25cm/10in in diameter. Put the chicken legs, celery and bay leaves into a large ovenproof saucepan, pour over the wine and stock and season with salt and freshly ground black pepper. Bring to the boil on a medium-high heat, cover with a lid and transfer to the oven for 30–40 minutes, or until the chicken legs are cooked and tender. Set aside to cool. Once cool, remove the meat from the chicken bones. The bones can be reserved and used for a stock. Break the meat into bite-sized pieces before transferring to a bowl. Strain the stock, reserving the celery and discarding the bay leaves, and measure out the liquid. You should have about 750ml/1 pint 6fl oz; if not, make up to this amount with a little extra stock or white wine. Heat a large frying pan and fry the bacon pieces on a medium-high heat for 3 minutes. Add the onion, cover with a lid and fry for a further 10 minutes until the onion is softened. Add the butter, stir until melted, and then sprinkle in the flour to make a roux. Pour the reserved liquid into the roux a little at a time, whisking as you add, and stir over a high heat until thickened to a smooth sauce consistency. Add a little salt and pepper, the reserved celery, crème fraiche and mustard and mix to combine before adding the chicken pieces. Spoon the filling into the ovenproof dish and level the top. Leave until cool and then chill, covered, in the fridge for 30 minutes. Meanwhile, prepare the pastry for the pie. On a lightly floured work surface, roll out each of the pastry sheets to about 3mm/⅛in thick. Cut each piece into long, thick ribbons, about 3cm/1¼in wide. You will need to make enough to cover the top of the dish, about 16 in total. Weave the ribbons together on a piece of baking paper, until you have a pastry top that is large enough to cover your pie. Chill in the fridge for 15 minutes to firm up or, if time allows, freeze until solid. Take the filling out of the fridge and brush the edges of the dish with a little beaten egg. Carefully slide the pastry lattice from the baking paper and lay on top of the chilled filling. Trim the excess pastry around the rim and lightly press to seal. Increase the oven temperature to 200C/180C Fan/Gas 6. Brush the pastry with the remaining beaten egg and bake for 30 minutes until the pastry is golden and cooked through, and the chicken is bubbling. Serve hot.